A part of Kershaw’s popular Shuffle line, Shuffle DIY is packed with extra tools and a little more heft. Weighing 3.5 ounces, Shuffle DIY is made for hard work. As a utility knife, work knife or multi-function folding pocket knife, the Shuffle DIY cuts through webbing, seat belts and cords in an emergency or through slash, steak, straps and rutabagas on the trail, in the warehouse and around the farm. The Shuffle DIY is made for every day carry. 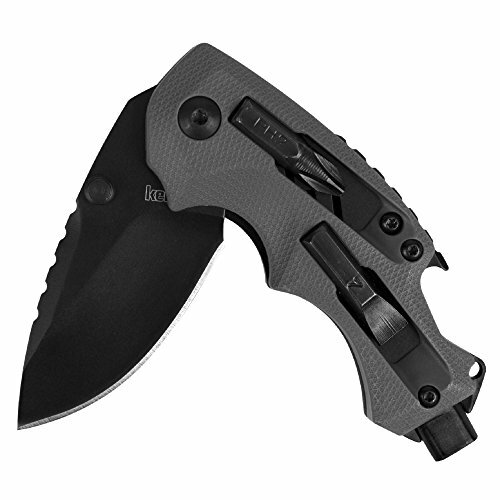 Besides its sharp, indestructible, drop-point blade, it boasts a bit driver, Phillips and flathead bits, bottle opener, jump ring, lanyard hole and deep carry capability for security, concealment and comfort. To honor traditionalists, Shuffle DIY opens manually, and to please Shuffle fans, DIY has notable good looks. A dark gray handle textured for grip complemented by a black blade coated for corrosion prevention gives all knife lovers a reason to buy Shuffle DIY for themselves or for the co-workers, friends and teammates they most appreciate.